per hour after the initial 4 hours. If you don't want to share your cruise with another group an exclusivity rate of R4500,00 will be charged. Please know that this is the original "Party Boat" and we have all the credentials to prove it. 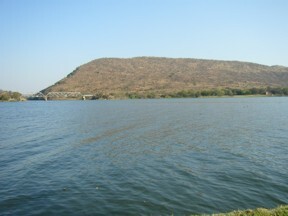 You have not experienced Hartbeespoort dam until you have done a cruise on the Harties Party Boat. 20 to 90 persons per cruise. A minimum booking of 20 persons per cruise is required. In peak season we reserve the right to book more groups per cruise where groups consists of less than 60 persons. Catered cruises hold the promise of a succulent meal with the necessary trimmings. Our cash bar is well stocked. This is, after all, a party boat! 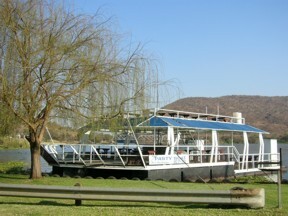 The Meerhof Harties Party Boat is the port of departure for the Harties Party Boat. A cruise on the Harties Party Boat exclude the use of any of the facilities at Meerhof Harties Party Boat other than access to Harties Party Boat. Further use of the Meerhof Herties Party Boat facilities can be done on prior arrangement with the Harties Party Boat events co-ordinator.